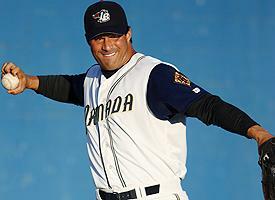 "Overall, it felt pretty good," said Canseco, who joined the independent Golden Baseball League earlier this year. "It took me a little while to get a rhythm out there, and I walked too many guys. It should get better ... I try to do the best possible. I'd love to throw a shutout or no-hitter or whatever." Yes, a no-hitter may be just around the corner, because Canseco also got his first career strikeout. And what we want to know is, who was the guy who whiffed against a 42-year-old knuckleballer, and when does he report to the Cubs? Sorry. That was just ... sorry.